A good Artemis day yesterday. First off, Terry Hutchinson and his team on Artemis White handily beat Team Korea in their quarter final match to advance to the Match Racing Semi Finals. Terry and the boys led the whole race and employed the "stay between the man and the hoop" strategy...jargon for mirroring your opponents every move once you are in front. After a few hours break to let the Blue Angels practice some flybys, the whole fleet got out on the track for two Fleet Races. Onboard Artemis Red, Nathan Outteridge pulled off two outstanding starts getting us to the first mark first in both races. Nathan's sense of when to pull the trigger and launch the boat toward the starting line is pretty darn good. Unfortunately, in the first race we had the bigger gennaker on when the smaller Code 0 was the sail to have and most of the teams went with the Zero. In the second race, Oracle Team USA Spithill rounded the first mark just inside us, we rolled them, and they gybed out to the middle of the Bay. They crossed ahead of us on the way back to the leeward gate. Up the first windward leg, Ben Ainslie Racing and Artemis White got around us. We did not seem super fast all the time upwind. But we held our ground there despite a serious charge at the end by Oracle Coutts. In the end, we on Artemis Racing - Red had a good day with two 4ths and are in a three way tie for second place after day 1. Ben Ainslie Racing (BAR) is leading with 21 points, Artemis Red, Oracle Coutts and Oracle Spithill all tied for second with 16 points. 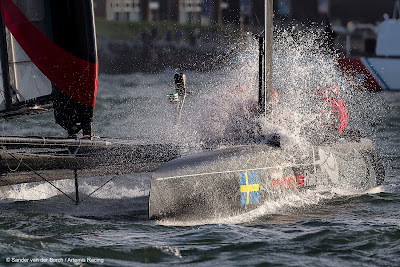 Emirates Team New Zealand is 5th with 14 points followed by Artemis Racing - White with 12. Things are really tight and it is early in the series. Remember that the Super Sunday race counts four times what these races count. 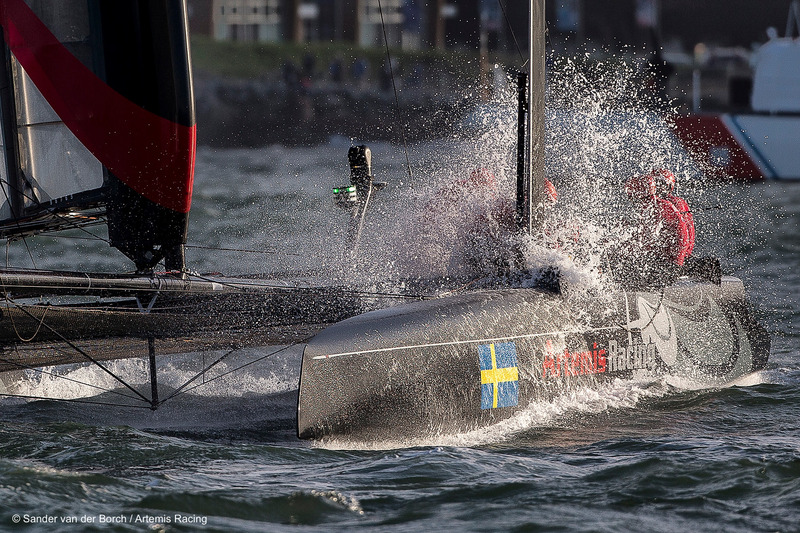 Racing continues today with Artemis Racing - Red taking on Oracle Coutts in the quarterfinals at 1600. BAR will take on Oracle Spithill shortly after and then the whole fleet will race two more fleet races starting at 1700.